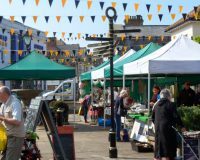 Comments: Camborne Produce Market is held in the heart of the town. It offers a full range of local seasonal foods including artisan breads, jams, chutneys, handmade pasties, cakes, pies, vegetables, eggs, plants, sausages and more. A full list of what will be at the market each week can be found on the Facebook page.